Everybody really seems to be so intimidated on how to use their essential oils. Don’t worry…I’m here to help! 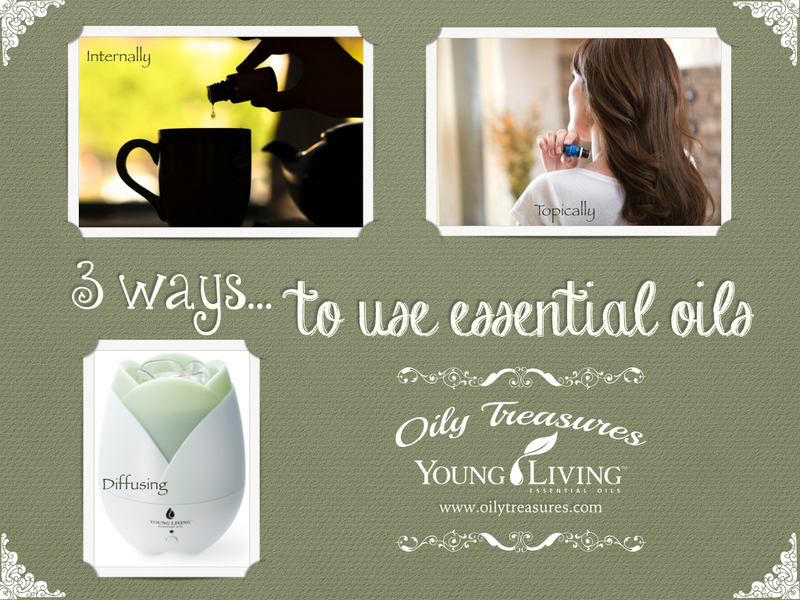 This is part one in a three part series on the 3 main ways to use your essential oils. Today we are focusing on the hows and whys of diffusing. Be sure to follow this blog via email (look for the “Follow” button over on the right) for future posts on using your essential oils internally and topically. For specific facts and tips on your Young Living Home Diffuser, click here. Reminder: This information applies only to Young Living’s therapeutic grade essential oils. Young Living is the only brand I trust to use for me and my family for purity, authenticity, and effectiveness. Diffused oils alter the structure of molecules that create odors, rather than just masking them. Relaxes the body and relieves tension. The sense of smell is the only one of the five senses directly linked to the limbic lobe of the brain, the emotional control center. Fragrance is the substance of memories and is very powerful. In less than a second, a scent has the power to activate a number of physical and emotional responses. Think about smells triggering memories in your life. Does the smell of chocolate chip cookies or apple pie remind you of baking with your grandma, or a certain perfume or cologne make you think of somebody? Synthetic air fresheners and candles are full of nasty chemicals. Instead of breathing in toxins and only covering up an odor, you could diffuse essential oils to gain therapeutic benefits. Use a cool mist diffuser like Young Living’s Home Diffuser to preserve the therapeutic benefits. The size of the room helps me determine how many drops of oil to add in my diffuser. Even in my largest rooms, I typically do no more than 6 drops in my Home Diffuser. I feel this is sufficient. In bedrooms I normally use about 2-4 drops. It also depends on how strong the essential oil is that I’m putting in my diffuser. Do not use more than one blend at a time because this can alter the smell and therapeutic benefits of the oils. A single oil may be added to a blend, however, and I often diffuse a few different single oils at once. Put your diffuser in a high spot in the room. Check the thickness of an oil before diffusing to make sure it’s not so thick it would clog your diffuser. If you don’t have a diffuser you can put several drops of essential oil into a spray bottle with a little bit of epsom salts. Then add distilled or purified water. The salt helps the oil disperse into the water. Shake well before spraying. Put a few drops of essential oils onto a cotton ball, tissue, or non-syntethic natural fiber material, and place it in your car, air conditioning vents, drawers, etc. Closely related to diffusing is another method of use called inhalation. Smell directly from the bottle. Place a drop or two in your hands and cup them over your nose and mouth and inhale deeply. Apply oils to a cotton ball, tissue, or non-syntethic natural fiber material, and place in the air vent of your car. Create a steam tent by putting several drops of an essential oil into a bowl of hot (but not boiling) water, draping a towel over your head and the bowl, and inhaling the steaming vapors. You can also just inhale the vapors without using the towel. Wear as a cologne or perfume by rubbing a drop or two of your essential oil on your wrists, neck, behind your ears, chest, sternum, etc. This entry was posted in Diffusing, How To, Personal Usage and tagged airborne bacteria, diffusing, eliminate odors, Essential Oils, how to, natural remedies, smell, therapeutic grade, tutorial, Young Living. Bookmark the permalink. Thank you. I’m so glad it was helpful for you.